NickLannon.com: Can We Forgive Pete Rose? Can We Forgive Pete Rose? As interesting as it is, you’re glad it’s not an hour long, right? In his introduction, executive producer Bill Simmons said, “you might not want to spend an hour in Pete Rose’s world at this point of his life.” No kidding. Another lingering shot of his back as he looks out at an empty memorabilia store? I was struck by Pete’s desire for a second chance. In Christianity, we call second chances “forgiveness.” Rose is desperate for it. As he alludes, it’s a little funny that avowed steroid users like Alex Rodriguez are still making their millions of dollars while Rose, who admits to betting on baseball and on (though never against) the team he played on, is a literal pariah, forbidden to have anything to do with professional baseball. Even Mark McGwire, poster-boy for steroid use (though he denies it) currently works as a batting instructor for the St. Louis Cardinals. Can you imagine a more appropriate job for Pete Rose than batting coach for the Cincinnati Reds? And yet, there he sits, behind a vinyl strap at a Las Vegas shopping mall, glad-handing customers and hoping to sell enough merchandise to pay his handful of employees. 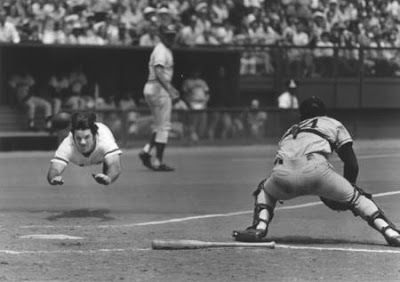 Pete Rose has even taken the first steps that seem to be required for forgiveness: he’s admitted the wrongs he’s done. He seems, in the film, to be honest, introspective (if a little over-proud of his admittedly amazing accomplishments on the diamond), and forgivable. It seems sure that if Pete’s asked for it, God has forgiven him…but can baseball do the same? “If we claim to be without sin, we deceive ourselves and the truth is not in us. If we confess our sins, he is faithful and just and will forgive us our sins and purify us from all unrighteousness” (1 John 1:8-9).